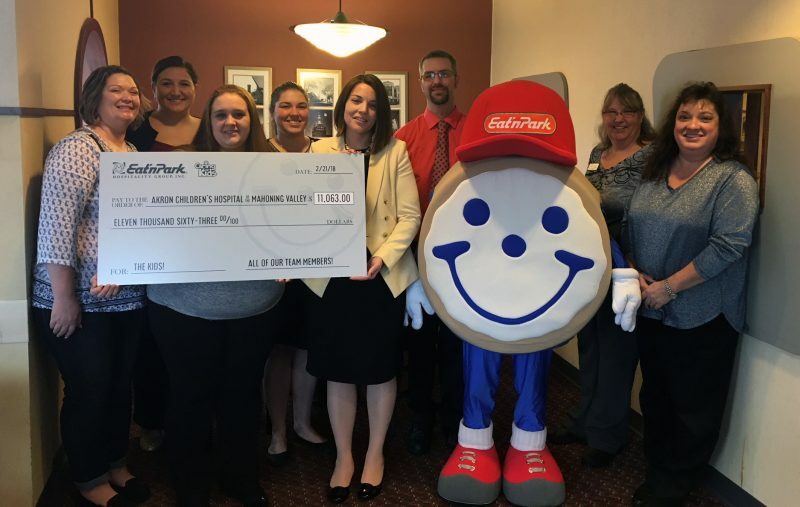 Local Eat’n Park Restaurants continued their fundraising efforts for Akron Children’s Hospital Mahoning Valley with their participation in the recently concluded 39th annual Caring for Kids campaign. The campaign raised $11,063 locally and was conducted through various fundraising activities at restaurant locations in the Mahoning Valley from Nov. 3 to Dec. 10, 2017. Since 2008, Eat’n Park has raised nearly $115,000 for Akron Children’s Hospital Mahoning Valley. Representatives from the Eat’n Park Corporate Office in Pittsburgh as well as the Austintown, Boardman, Steubenville and Warren restaurants presented the donation. “Through initiatives like this that engage Eat’n Park’s customers, it raises our hospital’s profile in the community and, most importantly, directly supports much-needed services right here in the Mahoning Valley,” said JoAnn Stock, senior director of development, Akron Children’s Hospital. The Caring for Kids campaign raises funds for children’s hospital throughout Ohio, Pennsylvania and West Virginia. The 2017 campaign raised more than $402,000, which brings the grand total to nearly $10.7 million raised since its inception in 1979. All funds collected from the Caring for Kids campaign stay within the communities from which they were donated to help children receive the medical care they need.